Where are the Corticioid Fungi in North America? Corticioid fungi are basidiomycetes that form crust-like fruitbodies on wood. These forms are frequently underrepresented in the collections of fungal forays. The simplicity of their macromorphology, the difficulty of their identification and their almost complete absence from field guides make them an arduous group of organisms to collect and study. However, corticioid fungi are abundant and easy to collect, even when other mushrooms are scarce. Their macromorphology may be simplified, but their microstructures are extremely diverse. Furthermore, their diverse roles in the ecosystems make corticioid fungi an intriguing group of organisms to study. To obtain a complete picture of fungal diversity in North America, it will be critical to focus on corticioid fungi. During a sunny day after some strong rains we go out to collect mushrooms. We get out of the car and everyone alone or with company starts the walk. We are drawn into the forest by the cooler temperature, the dim light filtered by the canopy and the diversity of mushrooms on the forest floor. Soon enough each one of us starts wandering around following one fruitbody after the other, hoping to find rare or common fungal residents of the forest. Once the collecting is over everyone brings the samples and lays them on a table. There I always feel what I call the loneliness of corticioid fungi fans. Most of my friends and colleagues will collect agarics, boletes, and less frequently polypores. I usually collect crust-like Agaricomycetes and this makes my collections less attractive to most people. The feeling of collecting these fungi is rewarding, but the frequent lack of people to share this excitement is discouraging. Do we underestimate the Agaricomycetes diversity by overlooking corticioid fungi? Somehow, I feel that this is a shared feeling among people who are attracted by the fascinating crust-like Agaricomycetes. The pattern seems to be common among fungal forays and it is shared between amateur and professional mycologists. After participating in several forays, I decided to check this pattern more thoroughly. I reviewed the published catalogs of the North American Mycological Association (NAMA) forays for 5 consecutive years (voucher reports 2007-2011). The forays took place in different locations across the Unites States. I coded the species based on their fruitbody morphology as follows: M=gilled mushrooms, BOL=boletes, POL= polypores and polypore-like forms, CAN=cantharelloid forms, CORT= corticioid forms, J=jelly fungi, HYD=fleshy hydnoid forms, PH=phalloid, GAS=gasteroid, RAM (for ramarioid) = coral like fruitbodies. Finally, I calculated the percentage of each type of fruitbody collected. 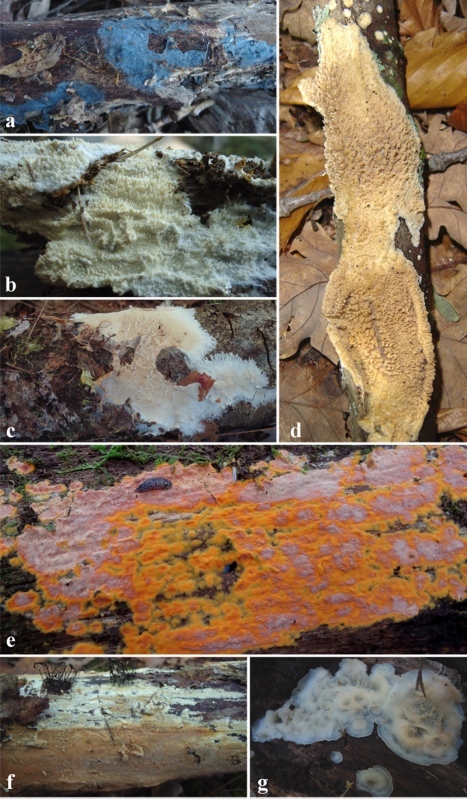 The reported species highlight the importance of fungal forays for estimating fungal diversity in North America, providing rich catalogues of species per region. In four out of the five years more than two hundred species were reported (Fig. 1). 2009 was the only year with fewer than 200 reported species and this could possibly be related to the weather conditions prior to and during the foray (Fig. 1). Despite the geographic distance and the collection variation among years, there is a unifying element; the percentage of the fruitbodies collected and catalogued indicates that 50-75% of the collections can be categorized either as a gilled mushroom or a bolete (Fig. 2). The other 25-50% percent of the collections is shared among the other types of fruitbody morphologies, but is dominated by the larger polypores. Corticioid fungi represent only 0.09% (2010) to 11.2% (2009) of the collected samples. An interesting observation is that for the year 2009, when gilled mushrooms or boletes were less frequently collected, corticioid fungi (and polypores) occupied a larger percentage in the collections (2009). This is not only a result of fewer gilled mushrooms and boletes being collected, which would increase the overall representation of corticioid fungi, but also the number of corticioid forms collected was larger than any other of the 5 years. This could indicate that corticioid fruitbodies are more frequently noticed, when the more typical fruitbody morphologies are less abundant. If we exclude this unusual year, corticioid fungi do not represent even 5% of the collections of each year. One could assume that corticioid fungi are rare and their frequency in the ecosystems resembles other uncommon fruitbody morphologies such as the phalloid forms. Are corticioid fungi as rare as they appear to be? Despite their scarcity on the checklists of NAMA forays, corticioid fungi are abundant in forested ecosystems. The actual number of corticioid fungi is not known, but it has been suggested that 900 to 1300 species exist in North America (Ginns, 1998). A more recent example highlights how frequently corticioid fungi occur in the ecosystems. During August of 2012 David Hibbett, seven members of his laboratory, including myself, a collaborating mycologist from the Northern Research Station (Madison, WI) and two visiting students from Finland and Sweden made a field trip at the Adirondack Ecological Center (Adirondack, NY) as part of the PolyPEET project (http://wordpress.clarku.edu/polypeet/). The collections included diverse types of fruitbodies, mainly of lignicolous Agaricomycetes. A preliminary survey of my collections from that trip indicates that among the 60 fruitbodies collected, 51 represent corticioid forms from at least 35 species. Several genera were represented including Phanerochete, Phlebia, Steccherinum (Polyporales), Tomentella ( Thelephorales), Botryobasidium (Cantharellales), Vararia, and Gloeocystidiellum (Russulales). Among those samples one could not be identified to the genus level (Fig. 3e) following two genera keys for corticioid fungi (Hjortstam et al., 1987; Bernicchia & Gorjon, 2010). Later on, this sample was found to have an ITS sequence that has no close match to GenBank, and may represent an undescribed species. That field trip targeted certain groups of corticioid fungi and therefore many specimens were left in the field. However, even with selective sampling the reported number of corticioid species exceeds that of any of the five NAMA forays previously mentioned. A general survey of corticioid fungi would easily result in hundreds of fruitbodies representing many species from different orders. A plausible explanation for the observed low collecting frequency of corticioid fruitbodies in foray records could be that they are less attractive organisms in comparison to other mushroom forming fungi. Species of genera such as Cortinarius, Amanita, Lactarius or Boletus are highly favored during fungal forays. Their abundant coloration, large size and diverse macromorphological characters make them more attractive than corticioid fungi in the field. Furthermore, the fruitbodies of certain agarics or boletes are edible and this provides additional motivation for their collection. However, it seems that the attractiveness or edibility of certain agarics or boletes can only partly explain the higher frequency of their collection in comparison to the corticioid forms. At the last NAMA foray (Ozarks, AR, October 2013) I had the chance to talk with many amateur mycologists. I was pleasantly surprised to find out that many amateur mycologists are curious about corticioid fungi and have many questions about their identification and ecology. But it was there that I realized the problems as well. Since the macromorphology of many corticioid fungi is simple, a microscope is required for their identification. Unfortunately, not everybody owns or has access to a microscope, which makes corticioid fungi a discouraging group to study. In addition, a look in mushroom identification field guides reveals that there is very little information regarding corticioid fungi of any given region, with few photographs and descriptions. For example the field guide ‘Mushrooms of Britain and Europe’ dedicates a little more than 200 pages to mushroom pictures, but only 4 of those include corticioid fungi. This pattern extends to other field guides as well (e.g. Mushrooms of Northeast North America, 1999; Mushrooms of the Pacific Northwest, 2009; Mushrooms and Other Fungi of North America, 2010). The lack of coverage of corticioid fungi makes them appear to be less important and rare, which is not true. The few mycologists who work with corticioid forms in comparison with other groups of fungi hinders amateur mycologists from getting to know these fungi. Additionally, we lack more inclusive studies that describe the corticioid fungi diversity of North America, similar to those that have been produced for Europe. Consequently, the chance of successfully identifying a corticioid specimen found during a fungal foray is low. What is a corticioid fungus and what is it doing out there? The fruitbodies of corticioid fungi in their most common form look like a simple paint stain on wood and can be annual or less frequently perennial. However, slightly more elaborate fruitbodies and characters can be found among corticioid fungi (Fig. 3). The hymenophore can be smooth, tuberculate, spinose, merulioid and in some cases poroid (Trechispora), while the texture of the hymenophore can be powdery, velvety, shiny or waxy. Furthermore, the margin of the fruitbodies differs among species. In some species it ends up abruptly, while in other species it gets detached from the substrate or is thinning out. Some species form extensive rhizomorphs that spread from their fruitbodies into the wood or soil litter. All of these characters are important for identification. It was realized early on that corticioid fungi are an artificial assembly of genera based on their simplified fruitbody morphology (Donk, 1964). The use of molecular characters supports the recognition of corticioid fungi as a polyphyletic and therefore ‘artificial’ group (Larsson et al. 2004, Binder et al., 2005, Larsson et al., 2007). They are found in almost every order of mushroom forming fungi including the Agaricales (e.g. Radulomyces), Boletales (e.g. Coniophora) and Polyporales (e.g. Phlebia). The polyphyletic origin of these fungi is reflected in their diverse micromorhology and ecology. There is large variation in spore size and shape, basidial structure, and types of cystidia seen among species. Most corticioid fungi are saprotrophic, acting as wood decayers or litter decomposers. Some species grow on dead branches that are still attached on the tree (Peniophora, Dendrothele). Such species are usually resistant to dry conditions or extreme temperatures. Others are found on wood of different sizes on the ground ranging from twigs to large logs at different stages of decay. They can be associated with white rot (Phanerochaete, Hyphodontia, Phlebia, Corticium) or brown rot (Crustoderma, Boreostereum). The necessity of corticioid fungi to form their fruitbody on a solid surface gives the false impression that all of them are wood decayers. However, some are litter decomposers with their mycelium residing in the soil. Furthermore, other corticioid fungi are biotrophs and form beneficial mycorrhizal associations with woody plants (Tomentella, Tedersoo et al., 2006) and orchids (Tulasnella, Roche et al., 2010) or they act as endophytes (Weiss et al., 2011). Many of these species use wood only as a solid surface for the fruitbody development. Finally, some biotrophic species are plant parasites (e.g. Athelia, Rhizoctonia; Ginns & Lefebvre, 1993). What is the best way to collect and study corticioid fungi? There is some good news here. In contrast to other forms of Agaricomycetes, corticioid fungi are easy to collect. Since their fruitbodies usually develop protected under wood debris (logs, branches), optimal environmental conditions are not required for their survival or revival. In days when it seems that you had no luck collecting fleshy mushrooms because of dry conditions, there are hundreds of corticioid fruitbodies hiding around. For many mycologists finding a corticioid fungus would not match the excitement of finding a freshly formed Amanita specimen in the field, but it can nevertheless be rewarding. Furthermore, corticioid fruitbodies are frequently small and it is often possible to collect a large number of species on a single log. For this reason many corticiologists claim that collecting corticioid fungi can sometimes result in covering only a few meters in an hour of collecting. This makes corticioid fungi an excellent target for days when collecting time is limited. In addition to what you would use for other types of fruitbodies (e.g. paper bags, boxes), a strong knife or a small handsaw are of great use to remove fruitbodies grown on hard substrates (e.g. freshly colonized wood). A hand lens will help you uncover the morphological diversity of corticioid fungi, which is usually not immediately seen by the naked eye. Corticioid fungi do not have the specific shape of a mushroom so people are frequently confused of how much of the fruitbody is right to collect. I have seen small segments of a fruitbody representing a collection. The best way to collect a corticioid fruitbody is to try to collect not only the central area, but also the periphery of the fruitbody, which includes important characters for the identification process. Including as part of the collection a piece of the wood on which the fruitbody has formed is of identification importance for saprotrophic species, since the presence of brown or white rot could facilitate identification. However, it should not be assumed that a corticioid fungus has always caused the decay on the wood on which it fruits; therefore, some mycologists describe certain corticioid fungi as ‘associated with’ white or brown rot. Special care should be given during the collection as to minimize disturbance of the collection site. Corticioid fungi grow most frequently under pieces of wood; overturning logs can have a disturbing consequence for fungi, arthropods and seedlings. Returning logs and large branches to their original position will help to lessen the disturbance. When rolling logs, collectors should be careful of snakes, scorpions, wasps or other creatures that may be hiding around. Collecting corticioid fungi is relatively easy, but identifying them is difficult. Unfortunately, to my knowledge there are no good field guides that cover corticioid fungi of North America. However, two books can still be useful; Fungi of Switzerland, Volume 2: Non Gilled Fungi: Heterobasidiomycetes, Aphyllophorales, Gastromycetes (Breitenbach & Kranzlin, 1986) and Fungi Europaei, 12, Corticiaceae s.l. (Bernicchia & Gorjon, 2010) are good taxonomic guides, but are too bulky to be brought into the field (and in any case, identification typically requires time with a microscope, with the relevant books at hand). They are however a good start and even though they are based on the European Mycoflora, they will still aid the identification of samples at least at the generic level. The second book is more up to date with the modern classification of corticioid fungi, but both include a large number of photographs, which will help the collector to develop a basic idea on how certain genera look. Participating in local mycological groups and associations can make up for the lack of a microscope, since such organizations frequently own their own microscopes. In addition, mycology laboratories in local universities (if present) usually respond positively to providing access to microscopes and literature for amateur mycologists. Even if a corticioid sample is not given a name directly at the foray site (which is to be expected), it is still a valuable specimen especially at the NAMA forays. The reason for this is that the voucher program of NAMA provides the opportunity to store the collected sample, which can be later identified by professional mycologists using traditional and molecular tools. This may sound like a long-term plan, but it will eventually pay back and you may get surprised to know that one of your samples represents a new species. Even though many people think that new species are to be discovered only from the highly diverse tropical rainforests, recent examples in bibliography suggest that North America still harbors many undescribed species (Matheny et al., 2010; Justo et al., 2011; Baroni & Lamoureux, 2013, Raymundo et al., 2013). Professional mycologists are in great need of the citizens-scientists and the expertise of the latter group in the field is often superior to that of professional mycologists, who frequently have very little time available to go out collecting. The limited knowledge of corticioid fungi in North America makes their rigorous study a necessity. Fig. 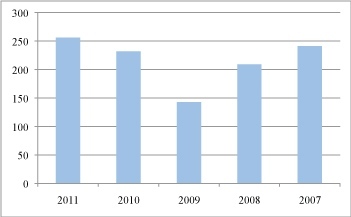 1 Number of reported taxa from five NAMA forays, 2007-2011. Fig. 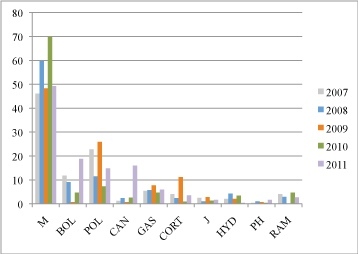 2 Percentage of fruitbody types represented in the NAMA voucher catalogues during a five year period, 2007-2011. Fruitbody types coding: M, gilled; BOL, boletes; POL, polypore-like; CAN, cantharelloid; GAS, gasteroid; CORT, corticioid; J, jelly fungi; HYD, hydnoid; PH, phalloid; RAM, ramarioid. Fig. 3 Fruibodies of corticioid species. a) Byssocorticium sp. (Atheliales) collected on wood buried under the leaf litter, b) Sistotrema sp. (Cantharellales), c) Phanerochaete sanguinea complex (Polyporales), d) Radulomyces molaris (Agaricales) collected on a dead oak branch still attached on the tree, e) unidentified corticioid fruitbody with a slug feeding on it, f) Phanerochaete velutina (Polyporales) with weathered slime mold fruiting bodies (Stemonitida), g) Phlebia tremellosa (Polyporales). The author would like to thank Dr. Michael Beug, Dr. James Ginns, Dr. David Hibbett, Dr. Alfredo Justo and Rodrigo Souza Ramos for their comments on the manuscript. Baroni, T. J. & Y. Lamoureux. A new species of Entocybe (Entolomataceae, Agaricomycetes) from Québec, Canada. Mycotaxon 123, 353–361 (2013). Barron, G. Mushooms of Northeast North America, Midwest to New England (Lone Pine Publishing, 1999). Bernicchia, A. & S. P. Gorjon. Corticiaceae s.l. Fungi Europaei 12. (Candusso, 2010). Binder, M., D. S. Hibbett, K-H. Larsson, E. Larsson, E. Langer, G. Langer. The phylogenetic distribution of resupinate forms across the major clades of mushroom-forming fungi (Homobasidiomycetes). Syst Biodivers 3 (2), 113-157 (2005). Breitenbach, J. & F. Kranzlin. Fungi of Switzerland, Volume 2: Non Gilled Fungi: Heterobasidiomycetes, Aphyllophorales, Gastromycetes. (Richmond Publishing Co. Ltd., 1986). Courtecuisse, R. Collins Guide to the Mushrooms of Britain and Europe (Harper Collins Publishers, 1999). Donk, M. A. Conspectus of the families of Aphyllophorales. Persoonia 3 (2), 199-324 (1964). Ginns, J. How many species are there? Folia Cryptog. Estonica 33, 29-33 (1998). Hjortstam, K., K-H. Larsson, L. Ryvarden. The Corticiaceae of North Europe, volume 1. Introduction and keys. (Fungiflora A/S, 1987). Justo, A., A. M. Minnis, S. Ghignone, N. Menolli Jr., M. Capelari, O. Rodríguez, E. Malysheva, M. Contu, A. Vizzini. Species recognition in Pluteus and Volvopluteus (Pluteaceae, Agaricales): morphology, geography and phylogeny. Mycol Prog 10, 453–479 (2011). Larsson, K-H., E. Larsson, U. Koljalg. High phylogenetic diversity among corticioid homobasidiomycetes. Mycol Res 108 (9), 983–1002 (2004). Larsson, K-H. Re-thinking the classification of corticioid fungi. Mycol Res 111, 1040-1063 (2007). Leacock, P.R. Voucher Report for the 2007 North American Mycological Association Foray. McIlvainea 18, 55-64 (2009). Leacock, P.R. Voucher Report for the 2008 North American Mycological Association Foray. McIlvainea 18, 65-72 (2009). Leacock, P.R. Voucher Report for the 2009 North American Mycological Association Foray. McIlvainea 19 (2010). Leacock, P.R. Voucher Report for the 2010 North American Mycological Association Foray. McIlvainea 20 (2011). Leacock, P.R. Voucher Report for the 2011 North American Mycological Association Foray. McIlvainea 21 (2012). Matheny, P. B., E. A. Austin, J. M. Birkebak, A. D. Wolfenbarger. Craterellus fallax, a Black Trumpet mushroom from eastern North America with a broad host range. Mycorrhiza 20, 569–575 (2010). Phillips, R. Mushrooms and Other Fungi of North America. (Firefly Books Ltd., 2010). Raymundo, T., R. Valenzuela, M. Esqueda. Hymenochaetaceae from México 6. A new Fuscoporia species from the Sonoran desert. Mycotaxon 125, 37–43 (2013). Tedersoo, L., T. Suvi, E. Larsson, U. Koljalg. Diversity and community structure of ectomycorrhizal fungi in a wooded meadow. Mycol Res 110, 734-748 (2006). Trudell, S. & J. Ammirati. Mushrooms of the Pacific Northwest. (Timber Press Inc., 2009). Weiss, M., Z. Sykorová, S. Garnica, K. Ries, F. Martos, C. Krause, F. Oberwinkler, R. Bauer, D. Redecker. Sebacinales everywhere: Previously overlooked ubiquitous fungal endophytes. PLOS ONE 6 (2) e16793. doi:10.1371/journal.pone.0016793 (2011).